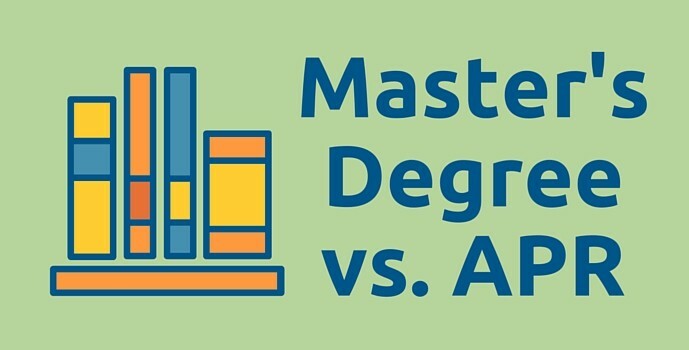 APR vs. Master’s Degree: Which Is Worth More? As an accredited public relations professional with a master’s degree in public relations management, I occasionally get this question from colleagues and peers looking to take their career to the next level. Since each path has distinct advantages and challenges, the answer may differ based on your experience and goals. The APR credential recognizes professionals who have effectively applied strategic planning and evaluation to their work. With that in mind, it’s a credential best pursued by those who already have experience applying PR strategy to their work. While taking an APR study course is useful for learning about communication planning, theory and other topics, you’ll need to have practical experience demonstrating that knowledge to pass the Readiness Review portion of the APR process. In contrast, a master’s degree in public relations or strategic communications is a great way to advance your career from a tactical-level PR position or to transition from another field. A master’s curriculum will include in-depth course work in theory, management and research, which will be tested through class assignments, comprehensive exams and a thesis (or for some programs, a professional project). Most individuals who ask this question work full-time, so time and cost are important considerations. Most master’s degree programs will require about two years of full-time study or three-to-four years on a part-time basis. (I finished mine in three years by taking classes two nights a week, including summer sessions.) Graduate work typically requires two hours of studying for every credit hour taken, so taking two three-hour classes in a semester would require a commitment of about 18 hours each week. Graduate school tuition varies widely by institution. However, at the in-state tuition rate for a public university in Florida, expect to start at about $15,000 over the course of the program. If you already have the professional knowledge, pursuing the APR credential is much more accessible in terms of time and expense. A working professional can complete the APR process in about a year, including participation in a study course, presenting the Readiness Review, and completing the computer exam. In-person courses are usually offered by local PR organization chapters (including FPRA Tampa Bay), and the official online course costs $195 for members of partner organizations (or $295 for non-members). The fee to pursue accreditation is $385, and FPRA offers a $100 rebate for candidates who successfully complete the exam within 30 days of completing their Readiness Review or study session. Both a master’s degree and the APR credential look great on a resume. Other public relations professionals will usually recognize the APR, and some job listings will list a preference for accredited professionals. Outside the profession, the credential is not as well known but may attract the curiosity of potential employers. A master’s degree is not often required for public relations professionals in many industries, but it is often a plus. It does open doors for teaching at the college level. Earning accreditation or a graduate degree both show prospective employers your commitment to the profession, and each demonstrates a significant investment of effort and resources. Choosing which one to pursue is a highly individual decision based on where you are in your career and your life. For information about FPRA Tampa Bay’s APR classes, email Karen Morgan, APR.